Order a set of four for $380. The Silencers are the best deal in audio! For as little as $90 you can upgrade the power to every component in your system, and with the benefits of a reduced noise floor they bring that K Works signature sound—black background, treble extension and detail, dynamics, all in the service of musicality. 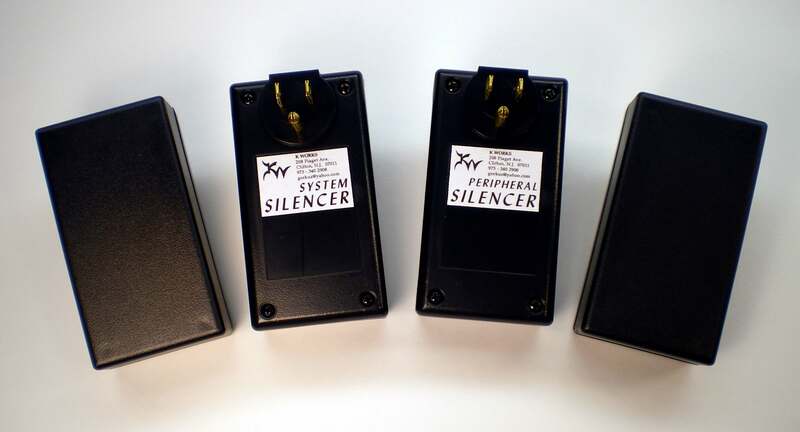 Physically, the Silencers are boxes that plug into any outlet, and clean and quiet the RF noise throughout your house. But do not confuse these with 2-line devices like “QuietLines” or “Noise Harvesters” which clean Hot to Neutral only (and have cheap parts). The Silencers are full 3-line devices, addressing not only Hot to Neutral noise but also the important ground line relationships, using high-quality Polypropylene and metalized film capacitors as well as ERS paper. They have no inductive elements that could suppress transients or ring. The Silencers have another unique and important feature. They come in two varieties, each optimized for the location you use it. For a Silencer plugged into the same house circuit as your amps and sources, you use a System Silencer. For any other circuit of the house, you use a Peripheral Silencer—those peripheral circuits pick up plenty of noise and deliver it through the junction box into your system circuit unless a Peripheral Silencer is there to absorb it. These two types target the noise optimally in each location. Do you already have power conditioning? The Silencers will work right alongside existing power conditioning. For instance, if your power conditioning device addresses your system power only, you can give it a big head start by using Peripheral Silencers in the other house circuits. You can even add a System Silencer to the input or output of your power conditioner, and the fast caps in the System Silencer will help improve transient speed. You might just discover that you like the signature sound of the Silencers better than the sound qualities of the unit you are using now, and replace that unit entirely with Silencers! The one exception is power conditioning based on isolation transformers–using a System Silencer on the same circuit as a transformer will present it with a non-linear load, causing it to heat up. This may or may not be a problem. If your transformer has a high K-rating (i.e. if it can handle non-linear loads) it shouldn’t be a problem, but you will have to try it out experimentally.